Macsome iTunes Converter is both an excellent iTunes DRM Remover and iTunes to MP3 Decoder which specializing in removing DRM from any of iTunes music and audio files and decoding iTunes to MP3 like converting M4P, AAC, M4B, M4A, and WAV to MP3, and any other iTunes-supported audio files, no matter the audio files are DRM-protected or DRM-free. Just rest assured to apply Macsome iTunes Converter. 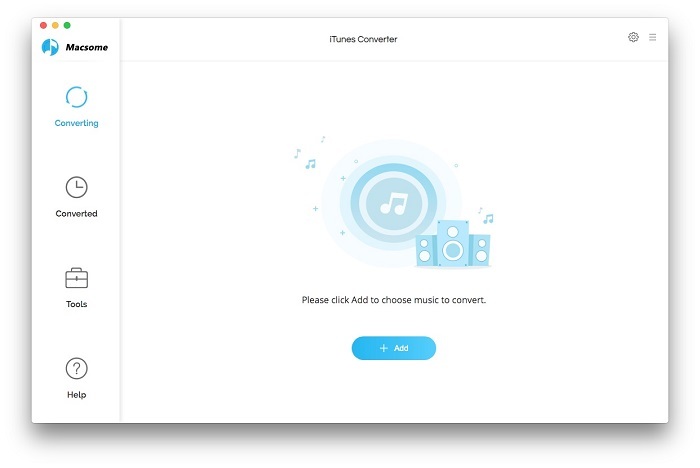 This iTunes MP3 Converter bypasses iTunes DRM tactfully by recoding iTunes audio files in the background during the conversion of iTunes to MP3, and the output audio quality is nearly the same with that of the original ones. So the whole process of removing DRM is totally legal and safe. Besides, Macsome iTunes Converter will preserve the converted audio files' ID tags information which are up to you to edit. Easy to Use. Macsome iTunes Converter is quite user-friendly, and any one, no matter you are a novice of this field or a professional, can handle this iTunes MP3 Converter. Legally iTunes DRM Remover. Macsome iTunes Converter is designed exclusively removing iTunes DRM for Mac users who suffer from the troubles caused by iTunes DRM. By recording iTunes DRM audio files in the background during the conversion, Macsome iTunes Converter carefully and cleverly circumvent iTunes DRM, so the whole process is completely legal. iTunes MP3 Converter frees iTunes audio files. It is really a good way to convert iTunes music and audio files to MP3 format, thus all iTunes audio files, no matter they are DRM-protected or DRM-free, can be played on your PSP, Zune HD, iRiver, Sony Walkman, Sansa, Cowon, Creative Zen, iPod, iPad, iPhone and mobile photos like Blackberry, Nokia, SamSung, Motorola, HTC etc. It is so cool, isn't it? Customizable Output Audio Formats. You can customize the output MP3 files as you wish to meet the needs of your portable audio players. Bitrate, Bitrate Types, Sample Rate, Channels, all these audio parameters can be adjusted. And since Macsome iTunes Converter supports converting iTunes to AAC, you can decode audiobooks to AAC with the original chapters kept. Batch Audio Files Converting. No need to convert iTunes to MP3 one by one. You can decode iTunes audio files to MP3 in batches, which will save you a lot of efforts and time. Fast Speed and CD Output Quality. Macsome iTunes Converter assures you high output MP3 quality. And the converting speed is quite fast, and just a minute, you can obtain your desired MP3 audio files.